Local excision for T1NX rectal cancer is performed to avoid the morbidity associated with radical resection. However, controversy exists regarding the optimal surveillance strategy. This study aims to determine the cost-effectiveness of surveillance strategies for locally excised T1NX rectal cancers. A Markov model with ten year follow-up was developed for cost-effectiveness analysis (CEA) of high (HIS), medium (MIS), and low (LIS) intensity surveillance strategies after local excision of T1NX rectal adenocarcinoma with low and high-risk features per NCCN guidelines. HIS includes luminal examination, local/global imaging, and tumor marker. MIS includes luminal examination and global imaging. LIS is luminal examination only. Literature review, expert consensus, and a local prospective database were utilized to populate state/transition probabilities and rewards. Eighty-seven percent of the patient cohort was designated as low-risk for CEA. Health care utilization costs were based on Centers for Medicare and Medicaid Services data. Willingness to pay (WTP) was set at $50,000; strategies with ICERs below WTP are considered cost-effective. The primary outcomes were cost in US dollars ($), effectiveness in life years (LY), net-monetary benefit (NMB) in $ and incremental cost-effectiveness ratios (ICERs) in $/LY. One-way sensitivity analysis was used to assess outcome variability of the model by ranging the proportion of the cohort with low-risk cancer features between 0-100%. 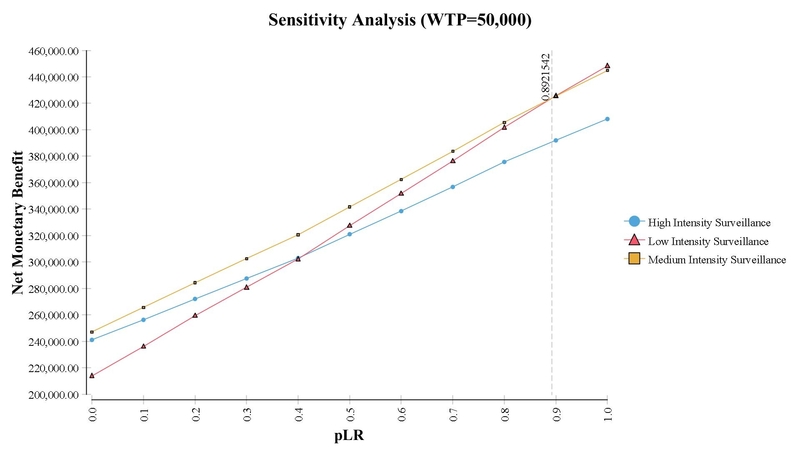 A probabilistic sensitivity analysis (PSA) was performed with a 10,000 patient sample to account for second-order variability effect on the model. Cost, effectiveness, and NMB for LIS ($24,180; 8.83LY; $417,178), MIS ($25,877; 8.89 LY; $418,392), and HIS ($65,234; 9.03 LY; $386,088) show MIS is the most cost-effective strategy based on NMB. ICERs for MIS and HIS were 29,155 $/LY and 278,981 $/LY. One-way sensitivity analysis demonstrates when less than 89.2% of the cohort is low-risk, MIS is optimal; when greater than 89.2% is low-risk, LIS is optimal (Figure). PSA performed on high-risk patients shows MIS and HIS are optimal 94.3% and 5.7% of the time with 95% confidence. PSA on low-risk patients shows LIS and MIS are optimal 83.4% and 16.6% of the time with 95% confidence. T1NX rectal cancers pose a heterogeneous risk for recurrence based on tumor characteristics leading to high and low-risk populations. This CEA for locally excised T1NX rectal cancer shows MIS, including luminal examination and pelvic imaging, is the preferred surveillance strategy overall based on a greater NMB and an ICER below the WTP. PSA shows cost-effectiveness of HIS and LIS for selected high and low-risk locally excised early rectal cancers. These results suggest cost-effectiveness benefits by varying surveillance intensity as a function of risk for this patient population.